No season in living memory has offered the embarrassment of architectural riches on view in exhibitions across the United States this summer. With retrospectives on Frank Gehry at the Solomon R. Guggenheim Museum, Robert Venturi and Denise Scott Brown at the Philadelphia Museum of Art, Rudolph Schindler first at the Los Angeles Museum of Contemporary Art and now at the National Building Museum in Washington, and a Ludwig Mies van der Rohe double-header in New York, not even the most avid proponent of the art can complain that architecture is being slighted, as it had been by major American museums for much of the last decade. Why, how, where, and when exhibitions on established artists occur can be traced to a variety of motivations, from so-called calendar shows that mark an anniversary of some sort to surveys that reflect the general perception that it is time for a fresh look at a particular body of work. In the case of "Mies in Berlin" at the Museum of Modern Art and "Mies in America" at the Whitney Museum of American Art, the reasons are more personal in nature. This exhibition project began as the brainchild of Phyllis Lambert, founding director of the Canadian Center for Architecture in Montreal, a study center and the world's foremost museum of the building art. An heiress to the Seagram liquor fortune, in 1954 she persuaded her father and the company's president, Samuel Bronfman, to let her select the architect for its new New York headquarters and to oversee its construction. The twenty-seven-year-old Lambert chose no less than Mies van der Rohe, universally acclaimed as one of the titans of modern architecture. Mies's rigorously simplified structures, typified by grids of steel and glass and an absence of applied ornament, represented the Platonic ideal of modernism for many people. He was rivaled at the time only by the two other architects whom Lambert considered most seriously for the job: Le Corbusier and Frank Lloyd Wright (whose Guggenheim Museum was erected two miles uptown during the same years as the Seagram Building). But Corbusier and Wright were increasingly interested in expressive effects that Lambert found dated and superficial. As she later wrote, "Mies forces you in. You have to go deeper. You might think this austere strength, this ugly beauty, is terribly severe. It is, and yet all the more beauty in it." The result of Lambert's precocious effort was one of the best tall structures of the twentieth century (though it is hardly the building of the millennium, as Herbert Muschamp hyperbolized in The New York Times two years ago, or, more preposterous yet, the building of two millennia, as he even more breathlessly maintained in his first review of the current Mies shows). Even within Mies's own oeuvre, an achievement more outstanding than the Seagram Building is surely his German Pavilion of 1928-1929 for the International Exposition in Barcelona. The masterwork was torn down after the World's Fair and reconstructed on its original site in 1986. With its seemingly free-floating wall planes and its open-plan spaces that go further than Wright's dematerialization of the box-like room, this was the most radical re-thinking of architectural enclosure until Frank Gehry's free-form experiments six decades later. Recently Lambert decided to originate an exhibition on the work that Mies did in the United States after he emigrated here in 1938, no doubt to memorialize her own remarkable role in his career. (As well as his role in hers: after the Seagram commission, she worked for a while in Mies's Chicago office and went on to become an architect in her own right.) A recent consortial arrangement between the CCA and the Whitney dictated that the show appear at that New York venue. Lambert approached Terence Riley, the chief curator of architecture and design at the Museum of Modern Art, home of the Mies van der Rohe Archive (its holdings are crucial to any serious exhibition on the architect), and asked him to join in her retrospective. Riley understandably declined Lambert's offer. Though she is extraordinarily generous with her fortune, she also possesses a well-known will of iron. Rather than joining forces with her, Riley sensibly decided to mount a separate survey of Mies's earlier career in his native Germany. The architect's working life divides quite neatly into two halves, thirty years in Germany, thirty-one in the United States (with the exception of a vacation house in the Rockies that he designed before leaving Berlin, and his New National Gallery in Berlin, completed a year before his death, in 1969). Thus the dual arrangement makes good sense, especially as it affords the enterprise an appropriate spaciousness that no single institution would likely give it. Mies's reputation has risen steadily since his hundredth anniversary, which unfortunately coincided with the full flood of American postmodernism and its xenophobic attempts to stigmatize him (along with his fellow German and erstwhile Bauhaus director Walter Gropius) as the fons et origo of alien International Style globalism. Yet even the provocateur Robert Venturi, who turned Mies's most famous dictum on its head by impertinently declaring that "less is a bore," has said that he wished he could take back his jibe at a master whom he now reveres. For all that Venturi and Denise Scott Brown profess to have learned from Mies, however, do not expect his brand of cool reductivism from them any time soon. And even though Mies's exacting minimalism has any number of present-day exponents--the British architects John Pawson and Graham Phillips, the much- sought-after Swiss team of Jacques Herzog and Pierre de Meuron, and their more talented countryman Peter Zumthor--none of them can be described as specifically Miesian. (That is especially true of Herzog and de Meuron, whose tendency toward haphazard detailing and materials that weather badly would make the Meister cringe.) Moreover, recent technological advances in everything from glass to adhesives enable today's minimalists to achieve effects much more stunningly simplified than anything Mies was able to accomplish. He wanted, he said, to create an architecture that was beinahe nichts, almost nothing; but present-day practitioners have extended the boundaries of nothingness in ways undreamed of a generation ago. Still, Lambert's autoreferential celebration could well turn into a self-fulfilling prophecy. Taken as a whole, the two shows and their excellent publications set out the most convincing case ever likely to be made for Mies. And if his oeuvre does not seem to cry out for such a thorough reassessment just now, still the quality of research and analysis that this undertaking has prompted is admirable. An international team of scholars in a Getty-funded MoMA seminar led by Riley and Barry Bergdoll, the organizers of "Mies in Berlin," has greatly advanced the Mies literature with its findings. Lambert and her group of essayists have done so as well. She was evidently determined to have the last word on Mies, and her exhaustive tome, at almost six hundred pages, is half again larger than the big MoMA book, in the identical Miesian square format. Her uptown exhibition is likewise larger than its midtown counterpart, though it can be argued that Mies had more work in the second half of his career. Neither Lambert nor MoMA tends to do things by half measures, so the combined effort has "definitive" stamped all over it. Yet there are notable disparities between the presentations at the two museums. The Whitney's "Mies in America" is by far the more successful installation. It was designed by the Spanish-born video artist Iigo Manglano-Ovalle, who employed an evocative array of Mies-inspired spatial divisions and circulation patterns, with backgrounds in a subtle spectrum of grays and off- whites. The mounting is so devastatingly chic that the minimalists among New York's fashionistas will be tempted to bring along their Frette futons and move right in. Still, this low-key approach is riskier than it seems: Mies's later drawings (with the exception of his marvelous large-scale photo-montages) have much less wall power than his high-contrast renderings of the 1920s. And despite the fact that Mies's late work is nowhere near as exciting as his post-World War I designs, the Whitney installation stresses its stately sublimity with such allure that the brash vitality of the young Mies can incorrectly seem somewhat gauche in contrast. Manglano-Ovalle also made new videos of four Mies buildings. Sometimes his work is a bit too good, such as his video of the New National Gallery of 1961-1968 in Berlin. Shown in a darkened, chapel-like space centered with a large, dramatically lit model of the building below the screen, that time-lapse study compresses the numinous light changes of a twelve-hour sequence into sixteen minutes. This hypnotic presentation can leave viewers who have never visited the actual structure with the misleading impression that this is a great building, when in truth it is one of Mies's worst. Mies originally designed the scheme of the New National Gallery for the headquarters of the Bacardi rum company in Cuba, and he transformed it into a plan for a museum after Castro's takeover in 1959 put an abrupt end to the original commission. The structure comprises a square glass-walled pavilion set atop a story-high granite podium with one glass wall. The light-flooded, one- hundred-sixty-six-foot-square upper gallery for changing exhibitions is terrible for displaying art, and the subterranean spaces for the permanent collection are bad in a completely opposite way. This almost laughable transmogrification of function--from office building to museum--and of location--from tropical Caribbean to northern European--exposes, more than any other Mies design, the severe limitations of his unending search for what he called "universal space." He believed that his extremely generalized structures could accommodate any use, but in the end they became too vaguely connected to specific needs to make them effective for any single purpose. ; His single- minded quest left out all the humanity that was palpable even in his most pared- down designs of the 1920s. That was the great trap of Mies's late career. Bedazzled by American notions of grand scale, he obsessively sought ways of enclosing bigger and bigger spaces with as few visible means of support as possible. Using huge roof trusses and space frames to cover over vast clear-span areas with no internal columns, Mies thought he was attaining some kind of architectural nirvana. Yet his single-minded quest left out all the humanity that was palpable even in his most pared-down designs of the 1920s. This is especially apparent in his unexecuted Chicago Convention Hall project of 1953-1954. That ten-story-high, half-million-square-foot structure, best known from the photomontage depicting a Republican National Convention in it (a choice of subject matter characteristically Miesian in its tropism toward the powers that be), would have reduced the fifty thousand people whom it could have held to ant-like insignificance. In addition to Manglano-Ovalle's videos, Lambert commissioned two series of new photographs of Mies's buildings, by Richard Pare and by Guido Guidi, both of whom have done similar assignments for other CCA shows. The men came up with some memorable images. Among them is Guidi's poignant shot of the now rather bedraggled Minerals and Metals Research Building of 1942-1943 at the Illinois Institute of Technology in Chicago, reminding us that Mies's architecture requires a high level of maintenance. Minimalism is pitiless in exposing flaws that traditional architectural styles cleverly concealed. In this earliest of Mies's executed American commissions, he did not have a budget ample enough to indulge his love of rich materials deployed with exquisite simplicity, epitomized by the sleek but sumptuous Barcelona Pavilion. At IIT in Chicago, where Mies became head of the school of architecture, all the fanatical attention that he lavished on how the parts were put together cannot fully distract attention from the run-of-the-mill quality of the components. (His financial restraints were exacerbated by wartime restrictions on most building products.) Only when he joined forces with the munificent Bronfmans would he be able to work with bronze and travertine instead of steel and brick. None of Pare's or Guidi's likenesses comes close to the stunning suite of chromogenic color photographs produced for the MoMA show by Thomas Ruff. It is titled "l.m.v.d.r.," for the initials of the architect. (He was born Maria Ludwig Michael Mies. In German mies means ugly--an inauspicious name for an aspiring architect; and at the age of thirty-five he appended his mother's maiden name Rohe and arrogated the Dutch noble "van der" to create a more imposing moniker for himself.) The series comprises pictures of Mies buildings that Ruff either took himself or digitally manipulated from appropriated photos. His propulsive, horizontally blurred portrait of the rebuilt Barcelona Pavilion was inspired, he has explained, by his notion of that building as a locomotive of modernism. This image is a brilliant distillation of Mies's masterpiece, and what Ruff's representation lacks in formal accuracy it more than makes up for in spiritual fidelity to the architect's dynamic vision. In another compelling picture, Ruff started with an old photo of Mies's Afrikanische Strasse Municipal Housing of 1926-1927 in the Wedding section of Berlin, super-imposing the name of the development and a flotilla of airplanes over the original picture. That eerie montage stimulates multiple associations, from the saturation bombing of the German capital at the end of World War II to the Berlin Airlift a few years later. The regimented formation of the aircraft also echoes the stiffly ranked Mies apartment houses below them, a pointed criticism of the architect's penchant for an almost militaristic sense of order. Another allusive work depicts Mies's apartment block of 1926-1927 at the Werkbund housing exhibition in Stuttgart (for which he also served as artistic director and head of planning). Ruff gave the windows of the severe, flat-roofed dwelling the same copper-mirrored coloration as the glass on the former East German parliament building in Berlin: this is the photographer's warning against the totalitarian dangers that are implicit in utopian planning. This consistently engaging series of photographs is the most provocative use of contemporary art to amplify a historical architecture exhibition that I have ever beheld. Unfortunately, the rest of the installation is badly misjudged. In place of the elegantly subdued palette chosen for the Whitney show, the MoMA team devised a red, yellow, and black scheme, the colors of the German flag of the Weimar Republic and today. Perhaps the idea was suggested by Mies's own use of those colors in the interior of the Barcelona Pavilion, with its black carpet, wine-red curtains, and a wall faced with panels of golden onyx. The overall look of the MoMA mounting is unattractive, and in several instances it is disastrous. Consider, for example, the placement of Mies's huge charcoal-and-crayon drawing of his Concrete Office Building project of 1923. It is displayed against a screaming scarlet wall, which causes the rendering to throb with optical vibrations, killing what one had thought to have been a visually invincible image. And bilious yellow walls are not the ideal backdrop for Mies's yellowing drawings, either. One can understand the desire to inject chromatic interest into the setting, but Manglano-Ovalle at the Whitney had a much better sense of how to do it. One saving grace of the MoMA installation is a stylish paraphrase of the Silk and Velvet Cafe that Mies and his early collaborator, the architect Lilly Reich, designed for a Berlin fashion exposition in 1927. In the MoMA re-creation, dark-gray silk panels suspended from curving ceiling tracks provide an uncommonly elegant context for the computers that have become an inevitable if unsightly part of museum displays. Both exhibitions incorporate the art of Mies's time with great effectiveness, and MoMA's admixture of works by Arp, Duchamp, Grosz, Kandinsky, and others cheek by jowl with Mies's renderings demonstrates the liberating effect of the recent "MoMA 2000" series, which juxtaposed disparate media with an illuminating freedom. Mingling art with architecture would have been unheard of at the time of the last Mies retrospective at MoMA in 1986. That centennial show, curated by Arthur Drexler, the museum's longtime director of architecture and design (who was in ill health and died the following year), was a disappointing affair. It offered no new insights into Mies's work and completely sidestepped issues that begged to be addressed at a time when the basic premises of modernism were under wholesale attack. Indeed, the exhibition was so aloof from contemporary developments that it could well have been organized in 1947, the year of MoMA's first Mies retrospective. The Whitney show opens with a reunion of some of Mies's small but superb private collection of twentiethcentury art--fine paintings and collages by Klee, Kandinsky, and Schwitters. (He knew the first two at the Bauhaus.) In a vitrine next to them are some of the books that had a formative effect on his thinking, including philosophical works by Heidegger, Jaspers, and Maritain. The personal memorabilia adds a revealingly human dimension that has been lacking in our perception of Mies, whose phlegmatic personality and glacial demeanor (at least until he imbibed more of his cherished martinis) has long stood in the way of perceiving him as a flesh-and-blood human being. As admirable as these two shows and their publications are, there remains an omission so major and so obvious that it is not merely the unacknowledged elephant in the room of this Mies revival, it is the veritable mastodon. In a comprehensive two-part project that is predicated around the turning point of Mies's career--his departure from Berlin to America in 1938--the architect's reasons for deciding to leave Germany, and indeed for choosing to linger there so long into the Hitler regime, are not mentioned at all. Though MoMA's last Mies retrospective lacked new ideas about his architecture, the museum three years later did publish a very significant book, Mies van der Rohe: Critical Essays, edited by the Mies biographer Franz Schulze. It addressed the subject's politics with a candor that makes the current show's huge and deplorable lapse all the more indefensible. ; The will of an epoch. The story is not an edifying one. In his remarkable essay "Mies van der Rohe and the Political Ideology of the Modern Movement in Architecture," the most important of the studies in the Schulze collection, the late architectural historian Richard Pommer mordantly observed that "politically, Mies was the Talleyrand of modern architecture." And he explained: "In less than ten years, he designed the Karl Liebknecht-Rosa Luxemburg Monument for the Communist Party in Germany, the Barcelona Pavilion for the Weimar Republic, a monument to the war dead for the Socialist-led government of Prussia, and a competition for the German Pavilion at the Brussels World's Fair of 1935, which, had it been built, would have been the first Nazi monument of international significance." In addition, just weeks after Hitler's rise to power in 1933, Mies participated in an invitational competition for an addition to the Berlin headquarters of the Reichsbank, the country's central financial institution. Mies behaved appallingly when he voluntarily put his name to an artists' proclamation published in 1934 in the Vlkischer Beobachter, the Nazi Party rag, on the day before Hitler became president as well as chancellor of the Third Reich. Along with the painter Emil Nolde and the conductor Wilhelm Furtwangler, Mies avowed that "we believe in this Fuhrer who has fulfilled our wish for unity. We trust his work.... [He] has called upon us to stand by him in trust and faith. None of us will be absent when it matters to bear witness." Mies finally absented himself from the Thousand Year Reich, just a year before the war broke out, only when it had become crystal clear to him that he would never make a go of it in the reactionary artistic climate created by the failed architect who ruled Germany. An acquaintance of Mies's reported him spinning a new version of the historical truth soon after he came to America (this, too, is from his FBI dossier): "the Hitler regime ... practically ruined him financially in Germany ... [but he] had not been sufficiently interested in his opposition to actively fight it." There can be little doubt that had Mies been taken up by Hitler, he would have remained in Germany. To be sure, the record of the other giants of modernism during World War II was pretty dismal. Le Corbusier, though not an outright collaborator, wrote polemics in praise of an unspecified dictatorial authority and shamelessly tried to curry favor with the Vichy regime, relocating for a while in the resort-turned-provisional-capital and precipitating a break with his closest co- workers. When his attempts to get work from the puppet government failed, he fled to the Pyrenees, where he hid for the duration of the occupation. And after Finland made a now-little-remembered alliance with the Nazis against their common enemy the Soviet Union, Alvar Aalto, the greatest Finnish architect, took a disgraceful inspection tour of German construction as late as the summer of 1943, treating the sordid episode as a long running joke. And Frank Lloyd Wright, confounded by the influx of competitive architectural talent from Hitler's Europe, was an ardent supporter of the isolationist America First movement. One of the rare master architects to acquit himself with courage and honor was Gerrit Rietveld, who joined the Dutch Resistance and used his artistic skills to forge passports, identity cards, and ration books. And let us not forget the early Miesling Philip Johnson, who commissioned a New York apartment from Mies in 1930 (at a time when the German architect had no other work) and included him in the influential International Style exhibition at the fledgling MoMA two years later. Soon afterward Johnson tried unsuccessfully to start a fascist movement in the Midwest, and fairly swooned at a Nazi Party rally in Germany, and stayed on in Berlin after the war started as a correspondent for Father Coughlin's hate-mongering sheet, the Orwellian- titled Social Justice. Camp-following the Wehrmacht into Poland, Johnson enthused about the invasion and sent home a series of virulently anti-Semitic dispatches. In one of them, subtitled "Jews Dominate Polish Scene," Johnson wrote: "Once on the Polish side I thought at first that I must be in the region of some awful plague.... There were not even any Poles to be seen in the streets, only Jews!" One of Johnson's first major projects after resuming his job as architecture and design curator at MoMA after the war was the Mies retrospective in 1947, which jump-started the architect's career in the United States. Its catalog was the first book-length treatment of Mies's work in English. Johnson is now ninety-five years old, and his rare public appearance at the two museums' opening dinner at the Seagram Building (for the construction of which he served as Mies's local associate architect, and designed the interiors of its Four Seasons restaurant) was a piquant reminder of the men's symbiotic and not altogether kosher relationship. It would have been wiser for the new MoMA catalog, which delves into such minutiae as Mies's use of photo-montage and the morphology of his courtyard houses, to have addressed the issue of his politics with the same degree of scrupulousness. By ignoring such a central subject in such an otherwise rounded view of Mies, the show gives off a mild stench of cover-up. Among the writers in the catalog, Vittorio Magnano Lampugnani touches briefly on Mies's Reichsbank proposal, and on Hitler's and Albert Speer's megalomaniacal plans for rebuilding the German capital; but his blandly descriptive approach sidesteps any value judgments. Only the German-born Rosemarie Haag Bletter (full disclosure: she is my wife) alludes to the verboten topic in her essay on Mies's flirtation with crystal imagery, drawing a sharp parallel between the architect's extensive use of Kristallglas (plate glass) and the ensuing devastation of Kristallnacht, which erupted just three months after he left for the States. An honest and impartial investigation by MoMA, the institution most responsible for the creation of the American Mies and for the maintenance of his myth, would have done much to clear the air. Was Mies a willing fellow-traveler of the Hitler gang, or an equal-opportunity panderer, or just a cowardly self-centered cad who abandoned his long-estranged wife, three daughters, and even his long-suffering mistress and collaborator Lilly Reich to endure the coming apocalypse alone after he sailed away to America? The alternative to an authoritative accounting is to leave the field to sensation- seekers such as Elaine S. Hochman, whose overheated but half-baked book, Architects of Fortune: Mies van der Rohe and the Third Reich, which appeared in 1989, did no service in the way of setting the historical record straight. So the MoMA show is a great missed opportunity, and quite a bit less definitive than it pretends. One can understand Lambert's hero worship of her surrogate father figure Mies, but what is MoMA's excuse for its evasiveness and indifference? The MoMA exhibition explores more deeply than ever before Mies's first decade and a half of independent practice, which for the most part consisted of traditional upper-class villas on the outskirts of Berlin. The early Mies design that has attracted the most critical attention in the current show is the Riehl House of 1906-1907 in the suburb of Neubabelsberg, built for the philosopher Alois Riehl, who became the ambitious Mies's cicerone into high intellectual circles. As Barry Bergdoll points out in his catalog essay about the relationship between Mies's architecture and nature, the Riehl House is not far from the dense concentration of country houses that Schinkel built for the Prussian reigning family in the 1820s and 1830s. Mies's design, with its pediment-like faade, addresses the "Royal Road" between the capital of Berlin and the kingly summer seat of Potsdam in an emphatically Schinkelesque manner. With its steeply pitched roof, however, it is in fact more reminiscent of the late Baroque vernacular structures that Schinkel was asked to remodel into classical retreats for his regal clientele. Nothing in the extensive evidence presented on behalf of this and Mies's other pre-modernist schemes suggests a high place for those works in the twentieth-century architectural canon. Though there are premonitory details here and there, without a previous knowledge of where Mies's career would eventually lead his early houses would seem not much more advanced than the villas being built around Berlin at about the same time by the Anglophile Hermann Muthesius in a modified Arts and Crafts manner. Far better and more truly modern were the contemporaneous residential designs of Heinrich Tessenow, including his stripped vernacular house in the Falkenberg Garden City of 1913- 1915 near Berlin and similar housing in the Hellerau Garden City of 1910 onward near Dresden. Search as one might for the seeds of greatness in Mies's juvenilia, he does not rise to exceptional interest until the early 1920s. At the time that Mies designed the Friedrichstrasse Skyscraper, the technology did not yet exist for it to be built. This was also the case with his undulating-walled Glass Skyscraper project of 1922. In imagistic terms, though, these proposals pointed the way directly toward the glass-walled towers that he would at long last construct in the United States after World War II, beginning with his high-rise apartment houses of 1948-1951 at 860-880 Lake Shore Drive in Chicago. 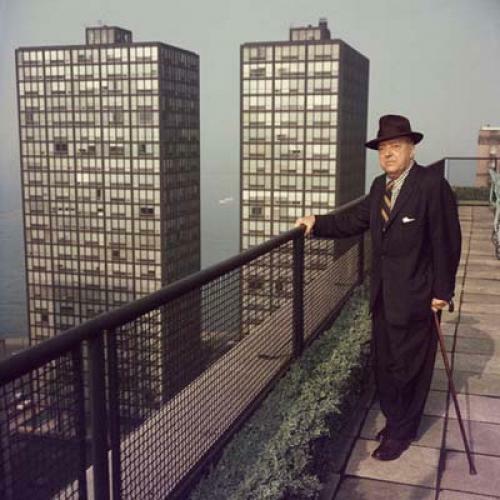 The embodiment of Mies's proudly self-proclaimed "skin and bones architecture," the cost-efficient format of those modular towers quickly became ubiquitous in the hands of lesser architects and even lesser developers; and eventually they became the cudgel with which the postmodernists tried to beat Mies down. Surely Mies cannot be blamed for the corruption of his ideas by others. And yet his epidermal and skeletal approach left out everything else in the anatomy of the building art--the musculature, the flesh, and ultimately the living spirit itself. Seeing Mies's six-decade career spread out in such detail, his domestic designs display an unending inventiveness and account for his best work. (Though it was not meant to be inhabited, the Barcelona Pavilion may be counted in this company.) The Brick Country House project of 1924 for Neubabelsberg revolves around a pinwheel-like floor plan evoking the staccato horizontals and verticals of the contemporaneous De Stijl paintings of Theo van Doesburg. The Tugendhat House of 1928-1930 in the Czech city of Brno ranks among the most glorious of twentieth-century dwellings, connected to its hillside site with a sensitivity that Wright or Aalto might have envied. The Resor House project of 1937-1938 for Jackson Hole, Wyoming--a flat-roofed wood and glass cabin deluxe to have been set amid stupendous mountain scenery that the window walls would have dramatically framed--showed an intuitive and intimate response to the American landscape. Among Mies's postwar public buildings, however, only the Seagram Building now stands out. The delicious tension between its chaste form and its luxurious materials remains a part of its enduring appeal; and like few other buildings of its period and its place, it still looks as good from three feet away as it does from three blocks away. What does not remain is the startling impact that the Seagram Building made in its surroundings as they existed when it was completed in 1958. Though the glass-walled Lever House of 1950-1952 by Gordon Bunshaft of Skidmore, Owings & Merrill already stood diagonally across Park Avenue from the Seagram site, the rest of the street was still a masonry canyon when Mies began his project. This contrast made the Seagram Building pop out with the power of Mies's photo-montages of the 1920s, which showed his proposed structures gleaming with modernist purity amid the leaden Wilhelmine historicism of Berlin. In 1958, the large plaza that Mies insisted on to front the Seagram Building was a rare exception to the almost unbroken street wall. Since then, a plethora of nearby office building plazas (the unfortunate result of well-meaning but wrong-headed zoning policies of the 1960s) has rendered Mies's expansive--and expensive--gesture far less forceful. In the end, Mies endeavored to create an architecture for all time; but just three decades after his death it is very clear that the architect knew what he was saying when he declared in 1923, with Zarathustran certitude, that "architecture is the will of an epoch translated into space." His influence on twentieth century culture cannot be overstated: more than any other figure, he formulated what is now generally understood as modern architecture. Still, try as he might to rise above his own troubled epoch and to turn his back on the immediate in his pursuit of the eternal, Mies remained very much a product of his time and his place, of each time and every place in which he found himself. From the vibrant Weimar Berlin that stimulated his freest work, to the cautious modernism that he fine-tuned to ingratiate himself with the Nazis, to the boring and repetitive work that he churned out for corporate America at its conformist apogee, he was indeed the true architect of the century.